An ideal submicrometer size ferrite bar magnet with large coercive field was developed from epsilon iron oxide (ε-Fe2O3). This bar magnet is resistant to strong magnetic field and electric current, and does not rust. Taking advantage of the properties of ε-Fe2O3 ferrite bar magnet, a probe for magnetic force microscope was successfully developed. Furthermore, high frequency millimeter wave absorption property was observed in ε-Fe2O3, and millimeter wave absorbing ink was prepared. ε-Fe2O3 microscope probe is expected to enable observations of the surface of strong magnets and magnetic material measurements under strong magnetic field, which had been difficult using the conventional techniques. Additionally, ε-Fe2O3 ferrite is drawing attention as high frequency millimeter wave absorbing material contributing to the IoT society. 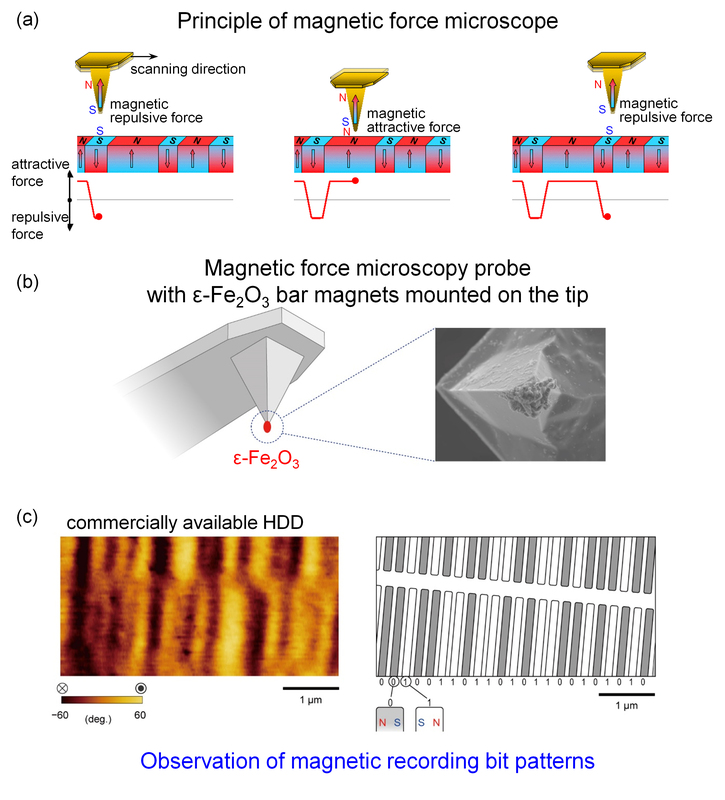 A research group at the University of Tokyo, Tsukuba University, and Hitachi High-Tech Science Corporation  synthesized ε-Fe2O3 single crystal ferrite bar magnet and developed a probe for magnetic force microscopy. Ferrite bar magnets are composed of abundant and low cost materials and have been used in toys, stationary, and crafts. Typical ferrite bar magnets are produced by hot pressing magnetic powder, and therefore, the bar magnet does not have single magnetic domain structure . However, in the present work, the research group succeeded in developing an ideal single crystal hard ferrite bar magnet with a single magnetic domain. This bar magnet is a submicrometer size single crystal ferrite bar magnet composed of ε-Fe2O3, whose magnetic poles do not easily flip even under strong magnetic field, ε-Fe2O3 bar magnet is resistant to strong magnetic field, electric current, and also does not rust. Taking advantage of these properties, the research group mounted ε-Fe2O3 on the tip of a cantilever and developed a probe for magnetic force microscopy (MFM). The present ε-Fe2O3-MFM probe enables conventionally difficult measurements such as observations of the surface of strong magnets and measurements of magnetic materials under strong magnetic field. In addition, ε-Fe2O3 bar magnet was found to exhibit high frequency millimeter wave absorption at 181 gigahertz (GHz), and the researchers developed a paint and film of this material. ε-Fe2O3 bar magnet is expected to contribute to the IoT society as high frequency millimeter wave absorbing materials for safe driving support systems, and so on, and is displayed in the special exhibition at the Science Museum, London from July 2016 . The present research achievement was released online from Scientific Reports on June 7, 2016 (Tuesday) at 6:00 p.m.
Ferrite magnet was discovered in Greece in the 7th century BC. Ferrite magnets  are composed of common and low cost materials; and they are used in bar magnets, U-shaped magnets, toys, stationary, and crafts (Figure 1). Figure 1. Long used ferrite magnets and an example of a ferrite magnet crystal structure. They are also used in industrial applications such as motors, magnetic fluids, drug delivery systems, and so on. For typical ferrite magnets, the coercive field  is not so large, but in 2004, epsilon iron oxide  (Figure 2a) was found to exhibit a huge coercive field. This ε-Fe2O3 is presently drawing attention as magnetic recording media and millimeter wave absorbing material. 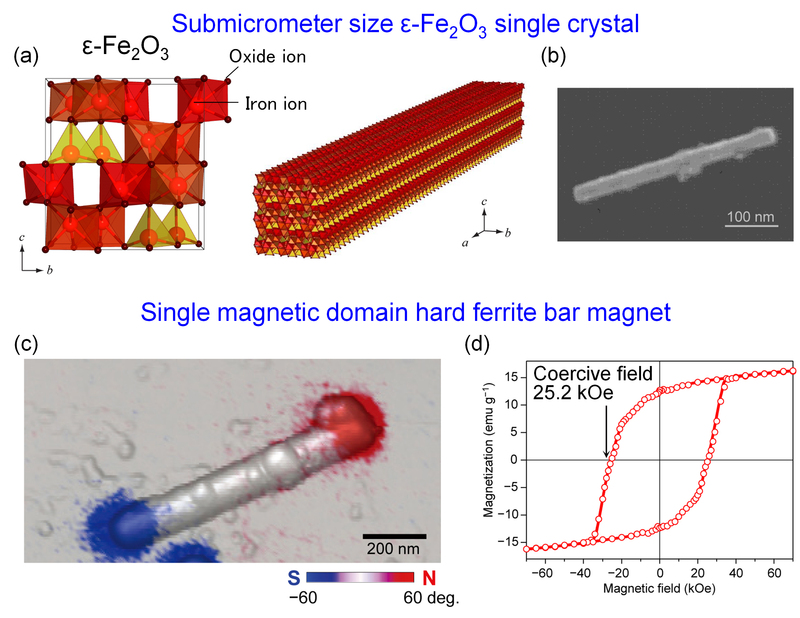 In this work, submicrometer size (0.1–1 micrometer) rod-shaped ε-Fe2O3 bar magnets were chemically synthesized(Figure 2b), and its magnetic domain structures were investigated. Atomic force microscopy (AFM) image of rod-shaped ε-Fe2O3 is shown in Figure 2c. The observed rod-shaped ε-Fe2O3 single crystal was 820 nm in length and 120 nm in width and height. The same area was also measured by magnetic force microscopy (MFM), and by combining with the AFM image, the north (N) and south (S) poles were observed at the edges of the bar magnet (Figure 2c), showing that the ε-Fe2O3 bar magnet has a single magnetic domain structure  with only one set of N- and S-poles. The longitudinal direction of this bar magnet corresponds to the crystallographic a-axis. From the magnetic property measurements, a huge coercive field of 25.2 kilo-oersted (kOe) was observed along the longitudinal direction of the bar magnet (Figure 2d). Figure 2. (a) Crystal structure of submicrometer size ε-Fe2O3, (b) scanning electron microscopy image, and (c) combined image of atomic force microscopy image (white and black) and magnetic force microscopy image (red and blue). Red and blue areas indicate the N- and S-poles, respectively. (d) In-field Magnetization vs external magnetic field plot of the oriented film of ε-Fe2O3 rods measured at room temperature. This coercive field of 25.2 kOe is the largest value among magnets composed of only iron and oxygen. Such a submicrometer scale hard ferrite magnet with a single magnetic domain structure had not been reported. Furthermore, the direction of the magnetic poles is along the longitudinal direction of the bar magnet due to the strong magnetic anisotropy of ε-Fe2O3 along the a-axis and not due to the shape anisotropy, which is clear from the spectroscopic studies in this work. Since ε-Fe2O3 bar magnet possesses a giant coercive field, using this material as an MFM probe would enable to observe surface of strong magnets (Figure 3a). Therefore, the research group carried out a trial production of MFM probe using ε-Fe2O3 (Figure 3b). The MFM probe was prepared by mounting ε-Fe2O3 on the tip of the cantilever. Using this ε-Fe2O3-MFM probe, the magnetic bit cells on a commercially available hard disc composed of a cobalt magnetic layer was successfully observed (Figure 3c). ε-Fe2O3-MFM probe is resistant to the magnetic fields from the observation samples or external magnets, and therefore, it enables observation of the surface of strong magnets and measurements under strong magnetic field, both difficult with conventional techniques . Figure 3. (a) Principle of magnetic force microscopy, (b) schematic illustration of the magnetic force microscopy probe with ε-Fe2O3 bar magnet mounted on the tip of the cantilever (left) and the scanning electron microscopy image of the cantilever (right), and (c) observed magnetic force microscopy image (left) and schematic image of the magnetic bit pattern (right) of the commercially available hard disk measured using the ε-Fe2O3-MFM probe. Gray and white areas denote the magnetic bit cells with the magnetic pole directions as shown in the lower left enlarged figure, which are expressed as 0 and 1, respectively. Additionally, ferroelectric hysteresis loop measurement of ε-Fe2O3 bar magnet showed that this material is a ferroelectric-ferromagnet exhibiting not only ferromagnetism but also ferroelectricity (Figure 4a). Such a material is called multiferroic material. From the correlation between magnetic polarization along the crystallographic a-axis and electric polarization along the c-axis, non-linear optical effect  is expected. Therefore, the researchers prepared a thin film of ε-Fe2O3 bar magnets in resin and developed a wavelength conversion film composed of ferrite bar magnet (Figure 4b). This film is a new type of non-linear optical film, which could control the wavelength conversion using the magnetic properties. Figure 4. (a) Submicrometer size ε-Fe2O3 rod with a single magnetic domain structure. The magnetic polarization (M) is along the crystallographic a-axis direction (purple arrow), which corresponds to the longitudinal direction of the rod, while the electric polarization (P) is parallel to the crystallographic c-axis (green arrow). (b) Schematic illustration of magneto-optical nonlinear Faraday effect in an oriented film of ε-Fe2O3 rods. Irradiating a horizontally polarized 775 nm fundamental light results in a vertically polarized 388 nm second harmonic output light, which was observed from the angle dependence measurement of the output light. In addition to the above mentioned aspects, the research group carried out optical measurements over a wide frequency range from 75 gigahertz (75×109 hertz, wavelength λ = 4 mm) to 750 terahertz (750×1012 hertz, λ = 400 nm), along with first-principles calculations, investigations of magneto-optical transitions such as Faraday effect , phonon mode , and Kittel-mode magnon , to understand the fundamental properties of ε-Fe2O3 bar magnet (Figure 5). Figure 5. Observation of Faraday effect, phonon mode, and Kittel-mode magnon in submicrometer size ε-Fe2O3. (a) Experimentally obtained Faraday ellipticity spectrum (upper left), calculated magneto-optical transition probability by first-principles calculation (lower left), and density of states of the electronic structure for ε-Fe2O3 obtained by first-principles calculation (center). Linearly polarized light is converted into rotated elliptical light by the optical transition along the longitudinal axis (parallel to the crystallographic a-axis), resulting in the Faraday effect (right). (b) Far-IR spectra (left), phonon dispersion of ε-Fe2O3 (center), and atomic movement of the lowest frequency optical phonon mode of 2.62 THz (calc. 2.51 THz) with A1 symmetry (right). (c) Kittel-mode magnon spectrum of the ε-Fe2O3 rod measured by THz time-domain spectroscopy and the fitted spectrum by the Landau-Lifshitz analysis (left), obtained magnetic permeability (center), and Kittel-mode magnon caused by the precession of the bulk magnetization around the magnetic easy-axis (longitudinal direction of the rod). 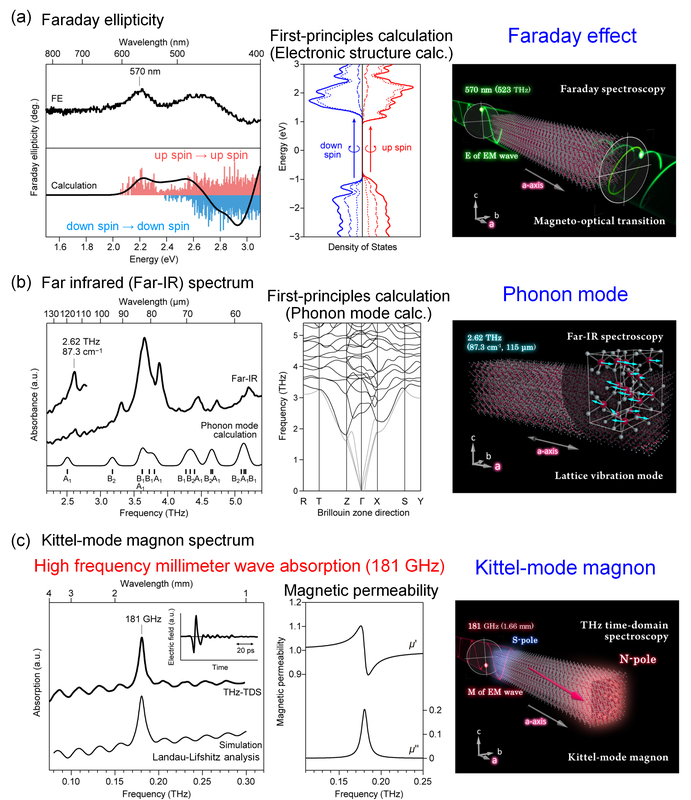 The study revealed that Faraday effect is observed when light is irradiated from the longitudinal (a-axis) direction of the ε-Fe2O3 bar magnet, and that the resonance frequency of the Kittel-mode magnon is as high as 181 gigahertz (0.181 terahertz), approaching the optical phonon mode frequency (2.62 terahertz) by 1/14 of the frequency. The observed Kittel-mode magnon frequency was found to originate from the strong magnetic anisotropy of the material. Taking advantage of this resonance in the high frequency millimeter wave region, the research group also developed high frequency millimeter wave absorbing paint. Prof. Shin-ichi Ohkoshi et al. first discovered in 2004 that epsilon iron oxide (ε-Fe2O3), prepared by making full use of nanoparticle synthesis, exhibits the largest coercive field (20 kilo-oersted, kOe) among ferrite magnets. They have also reported that ε-Fe2O3 is the world smallest hard ferrite magnet and that it shows high frequency millimeter wave absorption. ε-Fe2O3 and metal-substituted ε-Fe2O3 is expected to be applied to next-generation magnetic memory media for large capacity data storage and millimeter wave absorbing material for automobile driving support systems, and therefore, this material is drawing attention as a new material contributing to the future society represented by big data and IoT. ε-Fe2O3 powder and paint samples are scheduled to be displayed in a special exhibition at Science Museum, London from July 15, 2016.